For most of us, the bottom of a lake, river, or stream is simply the place where the water meets the land that lies beneath it. But for Knut Mehler, research scientist with the Great Lakes Center, that juncture is an ecosystem with endless variations. From springs in Nevada’s desert to bedrock under the lower Niagara River, Mehler has investigated the link between the physical characteristics of such regions and the benthic communities that live there. After graduating from Friedrich-Schiller University in Jena, Germany, Mehler traveled to the Desert Research Institute in Las Vegas for an internship while pursuing his master’s degree. “Because of Nevada’s geology,” he said, “the state has a high density of springs. And those springs are home to different species of hydrobiidae—the springsnails.” After completing his master’s in Germany, Mehler returned to the Desert Research Institute to earn his Ph.D. from the University of Nevada at Las Vegas. His research focused on the relationship between habitat characteristics and benthic macroinvertebrates, which included mollusks, insects, crayfish, and worms. He also studied the effect of spatial and temporal land use changes on trophic interactions of benthic communities using ecological stoichiometry. 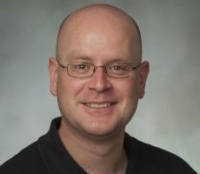 Mehler joined the Great Lakes Center as a research scientist in 2014 to join a team studying benthic communities and lake sturgeon living in the lower Niagara River. The study is funded by the Niagara Greenway Ecological Fund. Mehler, whose area of expertise is benthic ecology, has taken about 150 samples from the lower Niagara River to identify the benthic communities and relate the community to their specific habitat. Sturgeon are bottom feeders. By combining information about the benthos with information about the movement and diet of sturgeon, Mehler, along with his colleagues at the Great Lakes Center and the U.S. 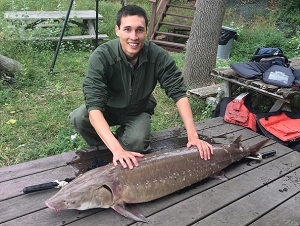 Fish and Wildlife Service, hope to gain more information about the food and habitat requirements of lake sturgeon, listed as a threatened species by the New York State Department of Environmental Conservation. The largest sturgeon Mehler has seen is about his size—six feet. “They’re an iconic fish,” he said, “the largest freshwater fish in the Great Lakes. They’ve survived toxic waste from plants, being overfished, and being discarded as a nuisance to commercial fisheries in the 1800s.” They can live a hundred years or more; females reach sexual maturity between 14 and 23 years of age, and males reach it at 8 to 19 years of age, according to the DEC. In addition to his work with lake sturgeon in the Niagara River, Mehler has worked on the EPA’s research vessel, the Guardian, studying invasive mussels in the Great Lakes. This summer, he will join the Guardian’s crew on Lake Superior.